The La Sportiva Python is a competition and artificial wall climbing shoe that combines high performance with comfort for modern climbers who want to push their level on boulder problems, overhanging sport routes, technical face climbs, and in climbing gyms. The La Sportiva Python has been designed to be as sensitive and as soft as possible with maximum performance on heel hooks and toe hooks. The sole is only 3.5mm thick and no lining is used at all, and La Sportiva have given it a 5/5 out on their sensitivity scale. Great for tiny, frictionless holds on overhanging problems! The sole has been split in the middle to make the shoe as soft as possible for technical manoeuvres like toe-hooking and general hooking onto steep holds, and the velcro strap secures the heel when heel hooking and blocking. The new Python has an improved toe patch for better toe-hooking performance and boasts a more comfortable fit than before. The Python is designed to be fit really snugly, but keep in mind that it's unlined suede leather upper will stretch up to a full size. So size appropriately! • A sensitive, snug fitting slipper with Velcro straps to provide secure positioning during heel hooks. • Ultra sticky heel provides stability and protection. • Extremely easy to pull on and off. • Ultra sticky toe rubber for increased performance on toe hooks. very reminiscent of the old model which i like, lots of room for wide feet! super sensitive! The best heel sportiva make. Why can't they make this heel on more of their shoes. I am a big fan of soft slippers for bouldering but I usually find that the heels are rock solid and wide. I had the Skwamas for a while after I blew out my first pair of pythons (after 2 years of climbing in them) but the heel was just a lump. Really glad to get my feet back in the pythons. Nice heel, but the front part is a little bit vide for me. Softer than the Solution. I miss the velcro from the front too a little. Before buying these shoes I wondered why it was that so many people have them. No more of that. The Pythons are simply a great shoe, aggressive but comfortable, super sticky for smearing but can also edge. And they help you develop stronger feet due to there not being so much support. I imagine these would not be ideal on super-long multi-pitch routes, but in an indoor setting they're up there with the best of them. As people mentioned before - try to size down as much as possible in these! I went from a size 45 in the Otakis, to 44 in these (46 street shoe size). The asymmetric toe box may be more comfortable for people with a more pronounced big toe. I've been using these for the last 2 months for indoor bouldering and they are easily in my top 3 favorite shoes of all time. The rubber on these is very sticky. The shoes are soft and sensitive. These smear great on slab or vertical walls, and the heel is excellent for hooking. Toe hooking is also a breeze with the extra rubber on the top of the shoe. I'm coming to this shoe after wearing the Scarpa Instinct VS (also an excellent shoe, just different from the Python). I picked these because I wanted something soft and sensitive and I am not disappointed in this regard. Notably though, the top of the Python isn't as tight as my old Instinct VS were. My Instinct VS had an almost compression-sock-type feel for me. The pythons feel loose in comparison. Not necessarily a bad thing though. I haven't noticed any detrimental effect on performance but this leads to my next point which is about sizing. In terms of sizing, I didn't have a chance to try these on beforehand, so I ordered a 39 based on my Sportiva Katana Lace ups being a 40. After wearing the shoe for a while, I know now I should have gone down even more to a 38.5 or even a 38 at least for indoor bouldering. In any case, I'll be buying these again for sure, and will have time to explore other sizes. Quality soft shoe for a great price! I've owned Python's for around 2 months, originally getting them to support my slowly wearing Solution's. Initially planned on interchanging on them depending on route and condition, but have now come to use them as a super comfortable training and comp shoe were edging isn't the priority and volume work is involved. Super comfortable after being broken in, and despite staining your feet a little bit orange, no complaints so far. The softest shoe I've worn so far, so will require getting used to, especially if like me you come from a stiff shoe like the Solution. Incredible smearing and sensitivity, but will require strong footwork to edge as well as stiffer shoes. For the price, easily one of the best soft and comp shoes on the market, but once broken in still exceptional for training due to the sheer comfort of the Python. Within 6 weeks this shoe fell apart, the rubber peeled away and was clearly a manufacture fault... The dealer has ignored me and also la sportiva team has ignored me. Zero customer service, absolutely shocked that both companies ignored my e mails about the shoes. Steer clear of these if not for the fact they could fall apart after 20 climbs the fact that if you have an issue with anything La Sportiva will ignore your issue as they don't give a damn about customers. The same issue we have had with the solutions to so I'm off to give them a great review to!!!! Really nice shoe, great heal. Soft shoe but still ok on small foot holds. You really need to size down on these i dropped a size from my normal sportiva size and could probably have gone another size smaller as they bag out a lot after a few climbs. Just bought my 4th pair of pythons. This shoe is suited for everything! No matter whether you go bouldering or sport climbing, slab or roofs, pro or beginner, you will love these shoes! For me, the pythons perform equally well on all types of rock/plastic and they are not very aggressive. They do stretch a bit so buy them tight, then they will be super comfortable after a few weeks! P.S. Don't be surprised if your feet turn orange when first wearing them. This was the first pair of La Sportiva shoes I have ever bought and was not sure how to size them. I have a low folume, wide fore-foot, narrow/skinny heel which makes it difficult for me to find shoes that fit, however, the Pythons fit me rather well. I'm a street size 42EU/8UK, and I bought these in a size 39EU/6UK. I fit Evolv shoes 44EU/9.5UK. When I first put them on they felt great, glove-like fit. After a few climbs in the gym the leather upper did stretch a tiny bit, however, this did not affect the fit at all for me. These shoes are made (in my opinion) for tough overhanging routes or routes with tiny nubs where you need a lot of power to stand on them. If you're looking for a shoe for all day climbing, these are not the pair. After an hour of climbing, the toes start to get sore. After 2-3 hours of climbing, the pain is unbearable. This often means that i have to stop climbing before my arms are tired due to the pain in my toes. If you want a shoe to do a tough climb or boulder problem as a 1-off climb or so, then these are perfect for that. These shoes perform great on tiny ledges and nubs, however, it does require a relatively strong foot as the rubber is quite soft and thin. The 3.5mm XS Grip 2 rubber does a great job at sticking to holds, and allows you a great degree of sensitivity. Unfortunately, these shoes are not the best at smearing. The aggressive downturn makes it difficult and painful to smear on walls, however it is still very possible to do so. Heel hooking is great on this shoe. The Velcro strap does a good job at killing possible dead space in the heel. Toe hooking is great as well with the big slab of rubber on the toe. The leather upper hold up really well with the stitching, but does stretch with use. The rubber lasts for quite a while longer than I expected especially since I've been using it in the gym a lot. Will probably last 8-12 months with heavy use. I bought these for 100€/86£. Do they do what I expected them to do? Yes. They perform great on small ledges and numbs, as well as gripping everything else. Do they fit after being broken in? Yes. In my books, this shoe is a great buy as they fit me well, and live up to my expectations. Comparing this price to other shoes close to 116€/100£, I would say this shoe is great value for money. 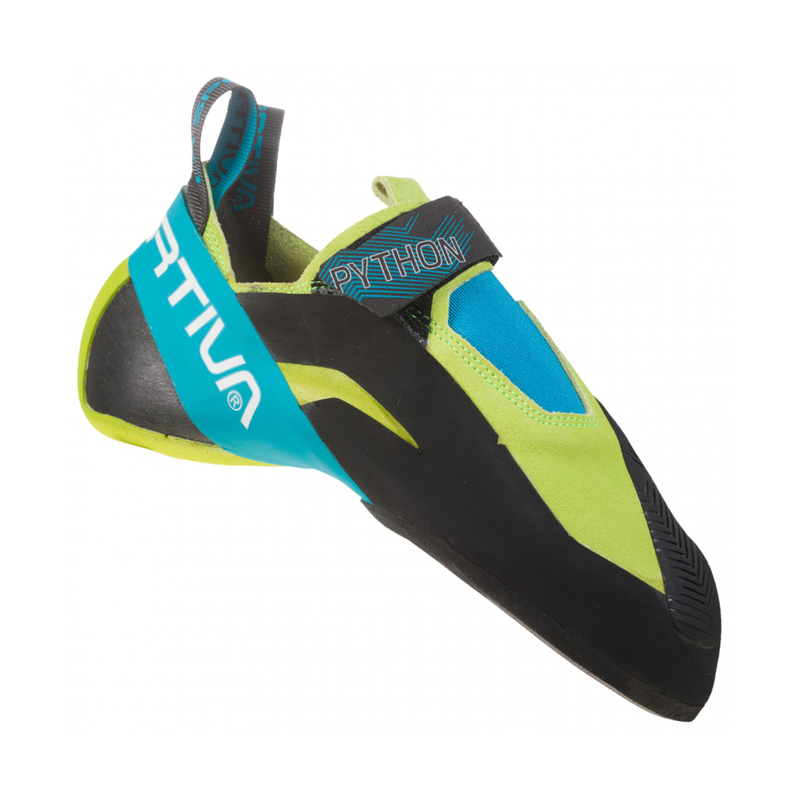 The La Sportiva Pythons are an aggressive downturned, high performing pair of slipper which are great for bouldering. They are for intermediate to advanced climbers who have a strong foot/toe. A smaller size, 1-3 sizes smaller, will give you the most out of these shoes with the downside of more pain. I think they are decently prices when compared similar performing shoes which are more expensive. If you need a shoe with a wide sole this is perfect for you. Super comfortable and soft, it's the best choice for your indoor training. However it performs pretty well also on the rock. Consider that the shoes tend to give more than other similar products (e.g. la sportiva solution) so I would suggest to buy an extra half size less than your usual la sportiva shoe. I sized these shoes for a tight fit and for the first few gym sessions they very uncomfortable. However they do stretch and get more comfortable. The toe and edges are precise and secure as expected. Would definitely buy again. I've had them for about 2 weeks now, toke them bouldering and sport climbing in limestone and on plastic. They have been brilliant everywhere. Should have sized them a bit smaller but the size I wanted was not available and I was really needing a new pair of climbing shoes. My Street shoe size is EU 45, I own the La Sportiva Mythos in EU 43 for my first climbing shoe (after climbing 50 times they could be even smaller, so, brand new 42,5 would do). It is a little too narrow (could be a little bit wider in the forefoot). It is also the narrowest shoe from La Sportiva I think, whereat La Sportiva is generally more a narrow fit. I also own La Sportiva Katana Laces, EU 43, as my second climbing shoes. Super fit, mid tension, little downturn, soft tongue, laces for a good fit (have low volume feet, little heel und narrow instep). Perfect, as I was searching for a fitting shoe for quite a time, because always the heel was too big! I wanted a new „secret“ weapon, something which I can definitely test my limits and push them. As I watched the 2015 IFSC Lead climbing worldcup on youtube, I recognized that about half the athletes were using La Sportiva Python or the Scarpa Instinct VS, so they must be really good shoes! Also in the bouldering worldcups, the Pythons (and a few Instinct VS) were very common, no matter if men or women. At first I was more interested in the Instinct VS from Scarpa, but at the next store (70km away) there were just too small models available. Pythons were a few there, but not the right size. I tried EU 42,5 for fun, but they were too big (EU 41 I didn’t try)! After much research on the web, reading tests, many comments and reviews, I decided to give it a shot and bought Pythons in EU 41,5 as my new competition and bouldering weapon! EDIT: later in the same store, there was EU 44 of the Scarpa Instinct VS. I could barely get inside the shoes, but then, they fit quite ok. A buddy has also 45 street shoes and bought them in EU 43, saying, they could be even smaller. Man, and reviews said that the Pythons are difficult to get inside them! Also there was a Five Ten Team in EU46, also maybe good, but I little too large, + a little too much air under the heel. Maybe 0,5 or 1 EU size smaller would be perfect, who knows. Scarpa Boostics were good, but EU 44 definitely too small. So 44,5 to 45 would it be. Miura VS and Testarossa I tried in EU 43,5, quite good, but my toes pressed hard against the upper toe box + I slipped upwards with the heel! Even a smaller shoe size, which would make the heel better, would definitely kill my toes! Testarossa offers a good feel though, and the pressure against the upper “wall” from the toes was better than with Miura VS.
Also Solutions in EU 43 were very good, but the worst heel of all! I really can’t understand why they are so popular without a good heel. Also the Testarossas heels were awkward in my opinion. What should I say, damn tight, not comfortable, just unfed leather with a soft sticky rubber sole (Vibram XS Grip 2). Since the shoe is completely made of natural leather (no synthetics), it will stretch, and because of the tight fit, it will stretch up to a full EU size (so I read). The first time bouldering I also did the warm water treatment. It was quite uncomfortable, but I could stay for about 10min inside the shoes, climbing around. Make no mistake, it was barely possible, I could deal with the pain, which was a bit lower than expected. Compared to other bouldering shoes, you can really edge with the Pythons! Surprisingly good! Also the shoes are very pointed – ideal for pockets or other little things, which requires very precise footwork. Heel hooks are good, the baggy upper with the toe hook patch is very, very good for toe hooking!! If you plan on standing longer, it gets awkward, because of the softness there is no support for the legs, and therefore you have to engage your muscles much more to stand than with a stiffer shoe. After use, your toes, your nails, your toe joints, your sole are orange!! Also after several uses! And water treatments. The water gets orange when coming out after 30 seconds! Right now, after several water treatments and about 5 times in use, it’s definitely getting better, but I still get orange! Also the end of the stitchings are not good, the material, in the inside of the shoe was very(!!) fringy, like La Sportiva should buy new scissors or blades to cut the material used for the shoe. My own scissors fixed most of the additional, overlaying, not cut of material. Those things didn’t harm the performance, the fit nor the feel inside the shoe, but this shouldn’t happen on a simple shoe, without any additional features for 100€! You read it several times that the quality of manufacturing of La Sportiva decreased or decreases for about 3 years now. Compared to how well Scarpa and Five Ten is manufacturing, I can definitely confirm now. Like other soft shoes with soft rubber, the lifetime will be limited due to wear of the sole. Resoling may be possible, I don’t know, but I think it will be. The Velcro strap still holds my feet in the shoe during extreme hooks, I don’t know how long, as there are people out there complaining that the Velcro gives in after time. Soft and sticky weapon for the hardest things you climb, especially for bouldering. Plain sticky sole, very good toe hook patch, good heel hooks (best for me until now). Due to soft shoes + soft sole, no support for the feet. You have to engage muscles to stand. You need to have narrow feet and egyptian toes, otherwise there is no chance the shoes will fit. They are quite to very uncomfortable, because you need to wear them tight. Whatever you do, at the beginning you definitely get orange! The shoes have no real value (if this is important to you). No features for the price. I recommend buying when on sale. Bueno, Bonito y Barato. Para mi pie el mejor ajuste de todos los que he probado (han sido bastantes) muy comodo, facil de calzar y bastante preciso. No echo de menos nada en este pie de gato, que aun siendo bastante blando tiene un buen canteo, el mejor talon en ajuste para mi pie y una durabilidad bastante aceptable. En cuanto a tallaje se puede ajustar bastante y normalmente la gente lo compra medio numero por debajo del Solution. If You prefer soft, sensitive shoes, pythons are the best for the price. Having my second pairs after I could not get resoled my old ones for the third time. Breaking them in is easy, and will form on your foot shape like a glove. Being so sensitive, its a more physical to climb (supporting is a lot less compared to solid boots like the Miura), but You can feel the shapes under Your toe, resulting better footwork. Only weak parts are the quick tireing velcros. Sizing wise I wear 39 compared to my 42-43 casual shoes.